Last Saturday as I walked among the graves at Mt. Olivet, an ancient Southern cemetery, I was suddenly overwhelmed with emotion. Next to many gravestones fresh Civil War battle flags were planted. These graves often had bronze plaques telling of their service to country (not the U.S.). They are maintained by Sons of the Confederate War Veterans who rightfully wish to preserve this piece of our heritage. Yet, as I looked around I was certain that some of these stones were also those of citizens who supported the Union (a word carefully avoided on the bronze plaques). Tennessee was the last state to secede and it was the first to re-unite with the Union following the conflict. That in death divide us, the living! I spent the afternoon with friends wandering among the tombstones in Mt. 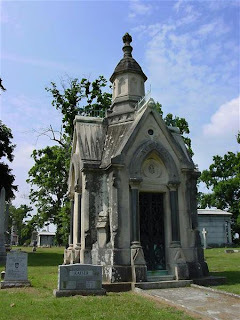 Olivet Cemetery here in Nashville. The skies were overcast and occassionally spit rain so we began our time together in Confederate Memorial Hall. This building built into the side of the hill was originally where bodies were stored for burial. In this crypt-like structure we learned about the many famous historical figures who were buried in this old cemetary. I was unprepared for how I would feel as I poked about among the graves. When the sun finally forced aside the clouds and the air became warmer, I sat under a beautiful old Magnolia tree listening to the cicadas sing. Unlike the dog days of summer, when they deafen, this song now was anemic rising to a crescendo and then stopping suddenly as if they forgot their purpose. In the distance I heard the hymn of interstate traffic occassionally punctuated by a truck ratcheting up - shifting gears. As I sat observing, I noticed the old Magnolia was covered with the skeletons of thick vines that had long ago been hacked off at the ground level. There bones formed a thick network and at one time probably posed a threat to the survival of the tree itself. As my eyes traveled down the trunk my attention was caught by tiny green English Ivy all around its base. Some of these tiny ivy were beginning their relentless march up the trunk again. How transitory is the work we do! The hand that mocked them, and the heart that fed; .